Born in 1371, Mary was the second of three daughters of Elizabeth of Bosnia and Louis, king of Hungary and Croatia, a member of the extended Anjevin line of the French Capetian dynasty. Since Louis had no sons to succeed him, Catherine, Mary, and Jadwiga were to be their father's heirs in Hungary and Poland as well as to his claim to Provence and to the kingdom of Naples*--making them not only desirable marital prospects but also a way for Louis to consolidate his power. Thus, before she was a year old, Louis had promised the Holy Roman Emperor that his second daughter, Mary, would be married to Charles IV's second son, Sigismund of Luxembourg, an agreement that was signed by deed in 1373. In 1375, Hungarian and Polish lords confirmed the arrangement. Meanwhile, Mary's elder sister, Catherine, was promised in marriage to Louis I, duke of Orléans, and her young sister, Jadwiga, was promised to William, the son of Leopold III, duke of Austria. 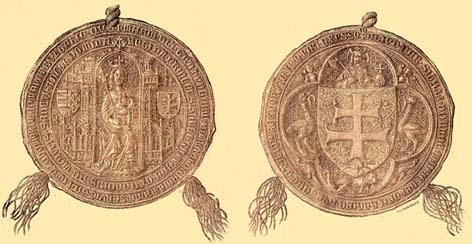 Louis of Hungary and Croatia's plans began to fall apart in 1378, when his eldest daughter died. Following her death, Louis confirmed his plans for Mary's marriage. By 1379, Mary and Sigismund of Luxembourg were formally betrothed, and Sigismund arrived in Hungary so he could learn not only the language but the customs of the country. In September 1379, in order to assure Mary’s succession in Poland, Louis summoned Polish nobles and ecclesiastical leaders so that they could affirm her rights to succeed her father. He achieved his goal, though contemporary reports suggest that the assent was not freely given. At the same time, Louis planned for his youngest daughter, Jadwiga, to inherit his throne in Hungary, though there is some evidence to suggest that, rather than dividing his kingdoms between his two daughters, he hoped to leave everything to Mary. Whatever his hopes may have been--for Jadwiga to rule in Hungary, for Mary to rule in Poland, or for Mary to inherit both thrones--his plans never materialized. After his death in 1382, Elizabeth of Bosnia moved quickly to claim the regency, and on the day following Louis' burial, Mary, rather than Jadwiga, was crowned "king" of Hungary. Meanwhile, although Mary had succeeded her father in Hungary, the Hungarian nobility preferred to be ruled by a king, not a queen--or, in this case, two queens, the dowager Queen Elizabeth, as regent, and the new queen regnant, Mary, still a minor. The proposed French marriage caused even more difficulties in Hungary. Despite the ongoing conflict, Queen Elizabeth completed the formal negotiations for the French marriage in 1385. But the French alliance did not save the Hungarian queens--Hungarian nobles invited Charles of Durazzo, the new king of Naples, into the kingdom. Although Sigismund of Luxembourg still hoped to marry Queen Mary, her mother refused, and Sigismund left Hungary in 1385, though he returned with an army. After the king of Naples landed in Croatia in September (with no sign of a French army coming to her aid), Queen Elizabeth changed her mind again. Sigismund of Luxembourg and Queen Mary of Hungary and Croatia were married in October. Despite this desperate move, Sigismund was not crowned king, nor was he given any official governmental role. Nevertheless, he continued his fight. Once Charles of Naples arrived in the capital in December, he claimed power. Mary quickly renounced the crown, and Charles was then crowned king of Hungary. Both Elizabeth and Mary continued to live at the royal palace, a situation the new king of Hungary would regret. Within a year, and with the connivance of the dowager queen, Charles of Naples was dead, the victim of an assassination. After Charles's death in February 1386, Mary was restored to the throne of Hungary, though her mother continued to rule in her daughter's name. Sigismund once again invaded, and since the son of the murdered king of Naples was inspiring some of the Hungarian nobility to continue their rebellion, the two queens reconciled with him. Sigismund's position as Mary's consort was recognized, and arrangements to repay him for lands that he had mortgaged in his fight for Hungary were made. Still, Sigismund left court after the treaty was signed, perhaps not yet content with his role in the kingdom. In an act that a fifteenth-century Hungarian chronicler said was "driven by folly," Queen Elizabeth decided that she and her daughter would tour the southern part of Hungary--those areas where support for the son of the murdered Neapolitan king were strongest. And, sure enough, there they were ambushed, their retainers and retinue killed, and the two women--Mary, queen regnant of Hungary and Croatia, and her mother, the dowager queen--were taken captive and imprisoned. Negotiations to end the conflict and free the queens did not go well, though it could have gone worse. Sigismund of Luxembourg was made regent of the kingdom. Queen Elizabeth was strangled in front of her daughter's eyes on the anniversary of the assassination of Charles of Naples. Queen Mary was not killed. Sigismund was finally crowned king on 31 March 1387. Mary was liberated just over two months later, on 3 June. On 4 July, she was finally reunited with Sigismund. 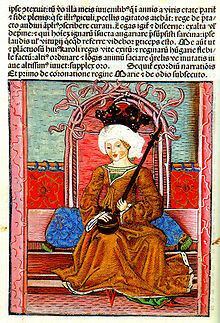 While she was queen of Hungary and Croatia, a co-ruler with Sigismund, she had virtually no authority. On 17 May 1395, still in her early twenties, a pregnant Mary of Hungary and Croatia suffered a fall from her horse while she was out hunting. The trauma of the accident sent her into a premature labor. She and her son both died. **Mary's younger sister, Jadwiga, was crowned "king" of Poland in 1385. Hers is a story that is only slightly less eventful than Mary's.